“It’s Monday! What Are YOU Reading?” | Felt Like Reading! When I replied to a Facebook post by Cynthia Lord, about a book vine, I was so excited to get her latest Shelter Pet Squad ARC (Advance Reader Copy) into the hands of a lucky reader! A book vine is when readers share a book via the mail, kind of like a wonderful literary chain letter. The first person reads it, sends it along to the next person, that person does the same, and so on until it gets sent back to the original person who sent it out, in this case, the author. I had participated in Cynthia’s book vine with an ARC of her latest middle grade novel, “A Handful of Stars,” which I loved and reviewed on my blog. Unfortunately, due to circumstances beyond my control, this time around the days on the calendar ran out before those who I’d planned to share it with were able to finish it and I had to send it along to the next lucky reader. The afternoon before I was due to pop it in the mail, I had to drive my husband to a doctor’s appointment, so I jumped at the opportunity to read it for myself in the waiting room before sending it on its way. The second book in this fun, engaging series for those beginning their journey into the world of chapter books does not disappoint. 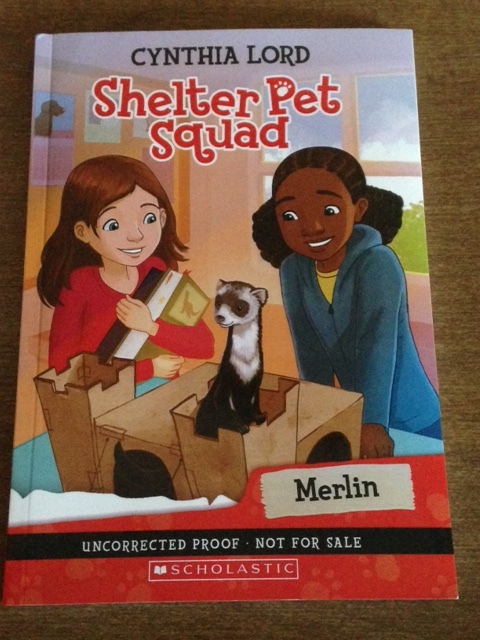 “Shelter Pet Squad: Merlin” is the story of a mischievous ferret who arrives at the shelter where Jada, Matt, Allie, Levi, and Suzannah, the narrator, volunteer. Merlin is a very different kind of pet than the Maplewood Animal Shelter usually encounters and it’s going to take a very special person to adopt him and provide the patience, love, and understanding that he needs. I’ll be honest. I’m a little freaked out by ferrets. I would definitely not be the right fit for Merlin. However, I can certainly appreciate the fact that all pets deserve a caring home. And I did learn a LOT about ferrets from reading “Merlin.” That’s something I absolutely love about this series; it is informational and, at the same time, inspires readers to participate in their community and worthy causes. The “Take Action!” section at the back of the book shares different ideas about helping out at your local shelter and the directions for all the Shelter Pet Squad activities are included as well. Through her desire to help Merlin find a home, Suzannah comes to terms with being the youngest member of the Squad and also learns that it’s ok to ask for help when she needs it. Like lots of kids, she wants to prove herself when the Squad does research on caring for ferrets, by being the one to carry the biggest, heaviest, most sophisticated nonfiction book in the bunch. However, not admitting that she is unable to read it could ultimately put Merlin at risk. Young chapter book readers and animal lovers everywhere will delight in Merlin’s tale. And who knows how many pets may find their forever homes as a result of Cynthia Lord’s Shelter Pet Squad series! Posted on August 3, 2015 by literacyteacherjenn	• This entry was posted in It's Monday! What Are YOU Reading?. Bookmark the permalink. Categories Select Category #bookaday challenge Books, Books, Books! Family Matters It’s Monday! What Are YOU Reading? Picture Books 10 For 10 Reading & Writing Reciprocity Teaching Through a Workshop Approach Uncategorized What’s New in Children’s Lit? Write On!